"CW Post" redirects here. For the former C.W. Post Campus of Long Island University, see LIU Post. For the breakfast cereal, see C.W. Post (cereal). Charles William "C. W." Post (October 26, 1854 – May 9, 1914) was an American inventor, breakfast cereal and foods manufacturer and a pioneer in the prepared-food industry. 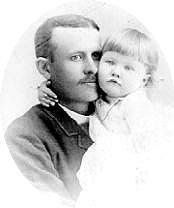 Charles William Post, commonly known as "C. W.", was born October 26, 1854 in Springfield, Illinois. He was the son of Charles Rollin Post and the former Caroline Lathrop, and grew up in the hometown of Abraham Lincoln, President of the United States during Post's boyhood years. Post graduated from the public schools of Springfield and enrolled at Illinois Industrial University (known today as the University of Illinois at Urbana–Champaign), where he remained two years before leaving without a degree. After a brief stay in Independence, Kansas, Post returned to Springfield, where he remained for over a decade working as a salesman and manufacturer of agricultural machinery. During this interval Post invented and patented several farm implements, including a plow, a harrow, and a hay-stacking machine. In November 1874, Post married Ella Letitia Merriweather; they had one daughter. Ella supported her husband throughout his career and cared for him when he was ill. As Post became wealthier and began spending more time away from Ella, who was often ill, he slowly drifted away from her. Against her wishes, Post separated from her in 1904 and married his second wife, Leila Young, his 27 year old secretary, in November 1904. Post's daughter, who remained close to her father, later said that her mother died of "a broken heart" after Post divorced her and married his secretary. Post suffered a mental breakdown in November 1885, the result of the stress and overwork which accompanied his job as a farm implement manufacturer. Post made a break with his previous life, moving to Texas in 1886, where he came into association with a group of real estate developers in Fort Worth, who were attempting to establish a new community on the eastern outskirts of a town called Riverside. In 1888, Post began a real estate development of his own in Fort Worth on 200 acres (81 ha) that he had obtained, platting the land for streets and homes and constructing two mills. The stress of this work again proved too much for Post's constitution, and a second breakdown followed in 1891. Post began a period of extensive travels in search of a cure, coming to take particular interest in the chemistry of digestion. After a period traversing Europe, Post visited the Battle Creek Sanitarium of Battle Creek, Michigan, a facility operated by John Harvey Kellogg. He was inspired to start his own company based upon the dietary products used there. In 1895, Post founded Postum Cereal Co., with his first product, Postum cereal beverage. Post's first breakfast cereal premiered in 1897, and he named the product Grape-Nuts cereal because of the fruity aroma noticed during the manufacturing process and the nutty crunch of the finished product. In 1904, he followed up the Grape Nuts label with a brand of corn flakes, which was first called Elijah's Manna before being renamed Post Toasties in 1908. In 1906, Post invested some of his substantial earnings from his food products manufacturing into Texas real estate, purchasing a massive 225,000-acre (91,000 ha) tract in Garza and Lynn Counties. Post platted a new town, which he called Post City. 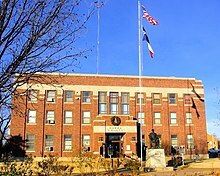 Shade trees were planted, farm parcels laid out, and a hotel, school, churches, and a department store were constructed for the new Garza County seat. In 1907 Collier's Weekly published an article questioning the claim made in advertisements for Grape Nuts that it could cure appendicitis. Post responded with advertisements questioning the mental capacity of the article's author, and Collier's Weekly sued for libel. The case was heard in 1910, and Post was fined $50,000. The decision was overturned on appeal, but advertisements for Postum products stopped making such claims. Post was a staunch opponent of the trade union movement and was remembered by the National Association of Manufacturers as one who "opposed bitterly boycotts, strikes, lockouts, picketing and other forms of coercion in the relations between employer and employee." Post was also a leading public advocate of the open shop system. At the end of 1913, the chronically ill Post's health deteriorated to the point that he canceled public appearances, which prompted speculation in the press regarding his well-being. In early March 1914, Post was believed to be suffering from appendicitis and was rushed via a nonstop train from California to Rochester, Minnesota, to be operated on by Dr. William and Charles Mayo, regarded as the preeminent surgeons of the day. Upon examination the Mayo brothers deemed Post to be inoperable, however, and the breakfast cereal magnate returned home to Santa Barbara without surgical remedy, still plagued by stomach pain. In the 1995 book American Empress: The Life and Times of Marjorie Merriweather Post, author Nancy Rubin claims that Post did indeed have the Mayo brothers operate successfully sometime between March 5 and 10, 1914. On May 9, 1914, despondent over his ongoing stomach illness, Post took his own life with a self-inflicted gunshot. His 27-year-old daughter, Marjorie Merriweather Post, inherited his company along with most of his vast fortune, one of the largest of the early 20th century . Marjorie Merriweather Post later married financier E.F. Hutton and owned a 177-acre (72 ha) estate on Long Island's North Shore called "Hillwood." Marjorie sold the estate in 1951 for $200,000 to Long Island University, which founded its residential C.W. Post College in 1954, marking the 100th anniversary of C. W. Post's birth. For a while named the C.W. Post Center and then the C.W. Post Campus, what was C.W. Post College has now become mainly a commuter campus called LIU/Post, and it has about 8,500 full- and part-time students and over 100,000 alumni. ^ "Post's Heirs Agree, No Suit Over Will: Widow of Cereal Manufacturer Accepts $6,000,000 Cash and Some Real Estate: Bulk Goes to Daughter: She Will Own Cereal Company and Other Property Estimated at $27,000,000 Value". The New York Times. December 9, 1915. ^ a b c d e f "Obituary: C.W. Post," American Industries, vol. 14, no. 11 (June 1914), pg. 43. ^ "MARJORIE MERRIWEATHER POST: a biography by Kenneth Lisenbee". www.paulbowles.org. Retrieved 2018-10-14. ^ Pendergrast, Mark (2010). Uncommon Grounds: The History of Coffee and How It Transformed Our World. New York, NY: Basic Books. pp. 101–102. ISBN 978-0-465-01836-9. ^ "POST: The Town". CCA: Post History. Archived from the original on 2011-02-25. Retrieved 2010-08-04. Charles Dudley Eaves and Cecil Allen Hutchinson, Post City, Texas: C.W. Post's Colonizing Activities in West Texas. Austin: Texas State Historical Association, 1952. Nettie Letich Major, C.W. Post: The Hour and the Man: A Biography with Genealogical Supplement. Washington: Judd and Detweiler, 1963. Jan Reid, "C.W. Post," Texas Monthly, March 1987. Rubin Stuart, Nancy (1995). American Empress: The Life and Times of Marjorie Merriweather Post. New York: Villard. ISBN 0-679-41347-2. Records of Post land colonization company in the Southwest Collection/Special Collections Library at Texas Tech University See also other Double U Ranch records.